She was 7 lbs and 14 oz at birth and at her last check up (around 6 weeks old) she was nearly 12 lbs! 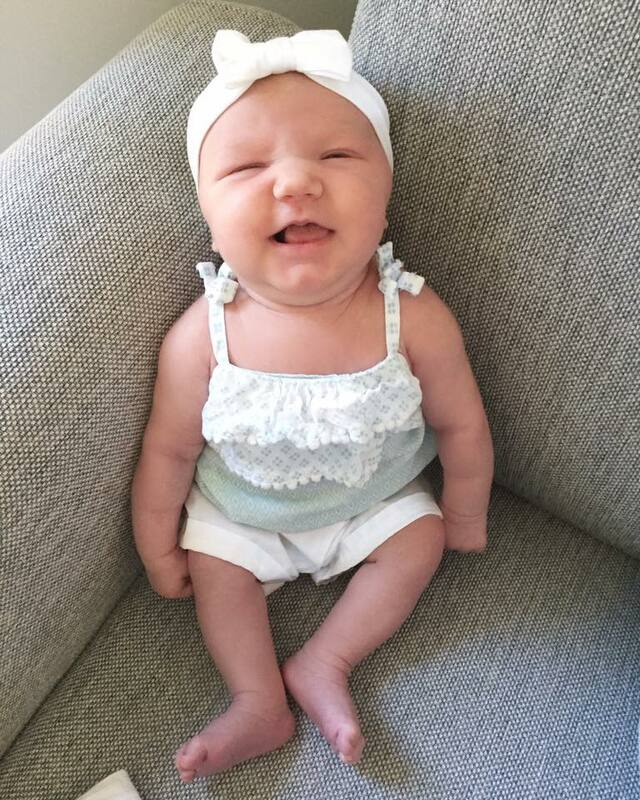 I can't remember exact length and such, but I do know she was in the 90th percentile for weight and head size, and 80th percentile for length. 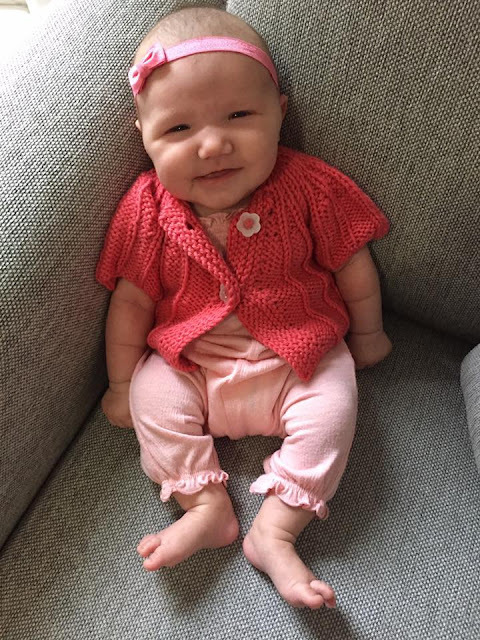 She quickly grew out of newborn clothing, and is wearing all 3-month clothing now... and even some of that is getting too small depending on the brand. Our favorite items so far are from H&M and Burt's Bees (Target). Bug has her fussy time in the evening, usually somewhere between 6:00 - 11:00 pm. During this time she doesn't sleep at all, and just eats (sometimes cluster feeds) and fusses. It can be pretty exhausting, so I'm hoping that eases up here soon. She has had a couple nights with 6 hour stretches, but the majority of the time we get one 4 hours stretch from 12:00 - 4:00 am and then a 2-3 hour stretch between 5:00 - 8:00 am. That's obviously not going to cut it when I go back to work (since I need to be in the office at 8:00 am)...so I'm hoping the sleep schedule gets a bit better over the next couple weeks I have of maternity leave. Like a champ. After trying to BF, I had to accept that it unfortunately wasn't going to work...so she has been on Similac Sensitive She wants 3-4 ounces every 2 hours, on average. She will go longer at night (as noted above), but sometimes wants to eat even more frequently than that during the day. Makes it hard to get much done sometimes! Side note - cluster feeding is a b*tch. Not sure about here eye color yet, some days they look brown and some days they look dark blue...so we will see! As for hair, it's mostly fallen out at this point and we are waiting for it to grow back. The bit that is there though, and her eyebrows, look like they have red in them when the sun hits, so fingers crossed for a ginger once it all grows back! Trying very hard to hold her head up, and is doing a great job at it! She is a doll! I love that Aubry calls her Moo. So cute. Booo to the witching hour. Both of my kids had those... eventually it'll get better! I'm sorry! Oh my gosh how ADORABLE is that first photo?? What a doll. <3 Baby fever is kicking in! Thank you!! She is such a sweetheart...I'm going to miss her so much when I head back to work full time this coming week!